When to Use “To Whom It May Concern”? Although the phrase “To Whom It May Concern” was a popular introductory greeting in the traditional workplaceTypes of OrganizationsThis article on the different types of organizations explore the various categories that organizational structures can fall into. Organizational structures, the term has since become outdated in the modern setting. The emergence of new communication trends such as the internet and online address books has made it easier to find the specific name of the person being addressed in an email or letter. Although the phrase is still used in certain communications, most recruiters consider the phrase an outdated and lazy way to address correspondence with a future employer. Rather, they much prefer, even expect, candidates to get the specific name and contact informationContact UsContact us directly for anything we can help you with. We have phone, email, and chat support. We're here to help you advance your finance career. of the people they are writing to. When sending correspondence, the sender should first try to establish if the target is a person with a specific role or title. If the sender establishes that the recipient can be “anyone” in the company, then it is right to use the phrase “To Whom it May Concern”. However, if the sender establishes that the recipient is a specific person in the company, then it becomes inappropriate to use that phrase. Instead, he/she should try to find out the name and title of the recipient. 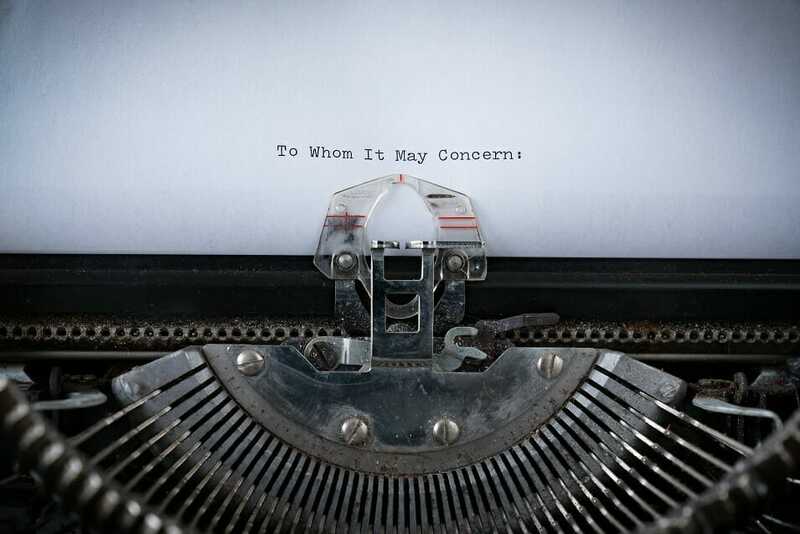 When corresponding with a person you have never interacted with before, it is safe to use “To Whom It May Concern” since you do not know the specific person or their title. It is common when a company receives a request from a representative of a company using generic contact information. When responding to the request, the sender may use the salutation “To Whom It May Concern” to establish a conversation. In the letter, the sender can request the name of the recipient which he/she should use in future conversations. When writing a recommendation letter for an employee or colleague, the letter does not need to have information about the hiring manager since it will be distributed to several recruiters. The candidates send their application lettersInvestment Banking Cover LetterInvestment banking cover letter template. Learn how to write an investment banking cover letter (analyst or associate) with our free guide and template. In order to help you get through the screening process, we've created this guide to writing a cover letter for an investment banking position. alongside the recommendation letters to multiple recruiters with the hope of gaining placement with one of them. In such a case, the recruiters are only interested in knowing the thoughts of the author of the recommendation letter on the candidates that they are considering hiring. This makes it safe to use the phrase “To Whom It May Concern” since the letter may be sent to one or more recruiters. When making complaints about the service or product of a company, the complainant lodges a formal complaint with the company without worrying too much about who the specific recipient will be. Also, the complainant does not have the time to research the appropriate person within the company to address the complaint to. Therefore, it is safe for the complainant to use “To Whom It May Concern” in the salutation section since the letter may be received by the customer service department, a senior executive, or even HR personnel if it is a complaint relating to a company employee. When sending a cover letter in response to a job advertisement, it is inappropriate to use the phrase “To Whom It May Concern” since this will appear lazy to the recruiters. Instead, the candidate should attempt to look for information about the company to know the hiring manager’s name. Some of the places to find the information include the company’s “About Us” page, the company’s LinkedIn page – or one may try contacting the recruiter to get the correct name of the hiring manager. Using the specific name of the hiring manager in the salutation instead of a generic salutation can make the candidate stand out in a positive way from the rest of the applicants. If the applicant is unable to find the name of the individual conducting the hiring, he/she can address the letter to the specific department of the company that is advertising the open position. For example, if the marketing department of the company is looking for new marketing assistants, the applicant can address the letter to the marketing department of the company. If the applicant fails to get the name of the hiring manager and the specific department of the company that is advertising open positions, he/she can address the letter directly to the recruiting department. It shows that the applicant at least did some research, since it’s the recruiting department personnel who are tasked with reviewing the paperwork to narrow down the list of candidates who meet the requirements of the job.